Katia a miss. . .Maria? Note: Feel free to follow my posts for work at http://nasasport.wordpress.com/ where I will post on some new satellite technology that helps us forecast better for you! A quick post as my thoughts from yesterday haven’t changed much at all. Katia looks to be a fish storm with high waves and rip currents being the major threat to the East Coast. Lee’s remains will continue to produce heavy rainfall in the central Appalachians. PA looks to continue to be the focus for the heaviest rainfall as seen in the 5 days HPC rainfall accumulation map below. The above image highlights the areas of interest in the Atlantic tonight. The red circles are Katia (left) and the newly born Tropical Depression #14 (right). The yellow circles highlight suspect areas for possible development in the next 48 hours. The area in the Bay of Campeche (southern Gulf of Mexico [left yellow circle]) is of particular concern as many models want to develop this area. The forecast issue is that the model solutions right now are very divergent with landfalls ranging from Mexico (GFS, CMC) to the Louisiana coastline (European) and even just drifting for the next 7 days in the Gulf (UKMET). I will focus on this area in coming days. 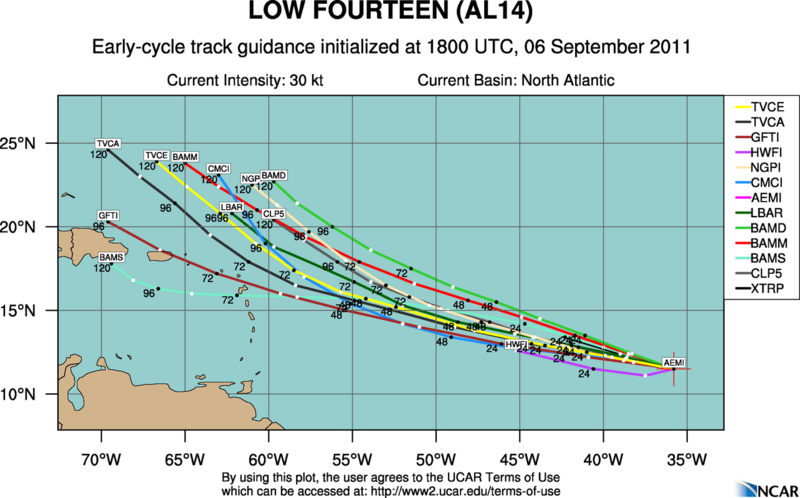 The track guidance above for TD14 is in fairly good agreement on a west-northwest course towards the northern Leeward Islands in about 72 hours. This seems a bit fast to me, but time will tell. I like the European model solution for this keeping it weak and further south, getting to the Leewards in about 96 hours. I think this will be named Maria by tomorrow as it has gotten quite organized in the last 24 hours. This could pose a serious threat to the Greater Antilles with a possible threat on the U.S. in about 7-10 days. It seems all the active weather is on the East Coast or in the Atlantic right now as we have gone into a rather “stable” upper-level pattern due to blocking in Greenland. Remember this when we get to winter because this type of pattern promotes snow and cold in the East. Meanwhile, the Alaskan southern coastal areas were greeted to hurricane force winds and waves to 60 ft. Who needs hurricanes? Previous Post Katia too close for comfort? As always thanks for the update… Please remember to redirect anything coming towards Delaware and NJ from Sept 24th until Oct 3rd. thank you!